You know the scene, browsing soon to end items on ebay, you catch something that's really cheap so you put a bid in and cross your fingers. I won this lens for next to nothing BUT I only bid on it because the seller described it as in good working condition, I know a few pound isn't much but it's the principal that counts surely? I wouldn't have paid a few pennies for it if I had know how it would turn up! I would have to say that the front element is rather loose to put it mildly! "Hi there, Just received the lens but there seems to be a problem, the front glass element is completely loose and rattling around, it looks like it could fall out at any moment. I'm not trying to say you sent it knowing it was broken but obviously the lens is unusable in this state and I would appreciate your thoughts about that to do. 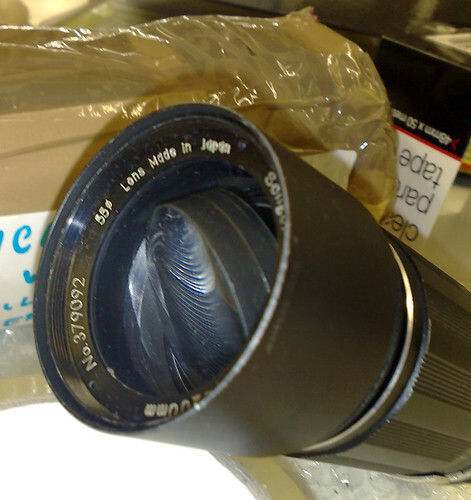 Here is a photo of the lens:"
"Hi ,I thought it was packed all right with it being in the case aswell.the postal staff must had a game of football with it.When I offered it for sale & indeed packed it there was no rattle or problem, if yo look at my feedback record ,you might assume that I am very fessy about what I sell ,this is clearly a transit problem.Either you or I must make a claim from the post office,Ive a feeling it might have to be me even tho it cost a pitance ,in any case keep the lens etc as evidence.There is no point in sending it back because of the cost involved but I can assure yo I wouldnt send out a faulty piece of equipment esspecially for a measly £2.00 Let me know your thoughts"
How rude! It was enough money for him to bother selling it in the first place! I cannot express enough how I know it really is a tiny sum but the principle remains that if I had known the lens was faulty I would not have paid anything at all. There is no way on earth that the element popped out by itself and on closer inspection of the sellers photos all seemed to show the lens side on, how convenient. I asked the seller to go ahead and ask royal mail for a refund but I never heard from him again so in due course I gave him a negative feedback for his efforts. If everyone in the world decided customer service was not an issue if an item only costs a small amount the world would be in a right mess. He called my money measly and a pittance yet he was unwilling to refund me! Hopefully in future he will realise that the key to being a professional ebayer is to treat all customers with respect and gratitude, even if they do only spend a measly amount. Your title says it all. eBay CAN be a great marketplace but somehow is often besmirched by shysters! I love that classic "you might assume im fessy..." bit. No, no I don't assume. I see a terrible looking product and well...my mind wanders! haha But I digress. I comment merely to commiserate with your frustrations. Just found your blog and I love it. I operate a similar post. Love finding old gear and giving it new vitality! I had a Soligor telephoto lense where the front mount shook itself out during a very bumpy bus ride in Tanzania. I couldn't use it again till I got back to the UK, when I managed to secure it again with the help of a set of watch makers screwdrivers. what did you do with this? I would be interested in the parts.